Axiomtek’s eBOX310-830-FL is an ISO 7637/e13 certified vehicle PC that not only meets expected performance but also provides better expansion capability, power control behavior and protection. ISO 7637 with ACC Function and Full Protection Most SI and VAR are knowledgeable and experienced with software design, but still need a reliable hardware support for this unique market. The eBOX310-830-FL is an embedded system that provides full protection against high voltage variations. Users can power on and off any vehicle without having to reboot or turn off the vehicle PC. All functions can be controlled by its unique microcontrollers and firmware. To prevent battery damage, minimal power leakage is under 5mA. In response to demand for communication features, the eBOX310- 830-FL supports dual PCI Express Mini Card slots that can be used to install WiFi, 3G or GPS module easily. 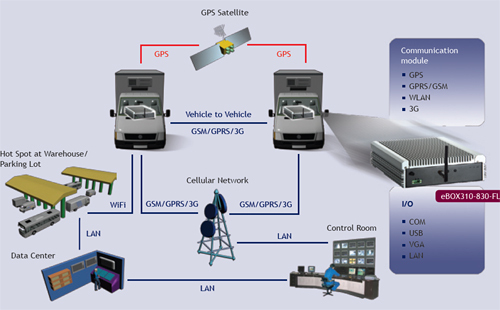 It provides one SIM slot and three SMA connector openings for applications such as, but not limited to: vehicle speed, location, data transfer or video capture. The eBOX310-830-FL supports optional CAN Bus interface, allowing for easy connectivity to the oxygen sensor, tachometer or speedometer to monitor the vehicle’s status. The eBOX310-830-FL features dual independent graphics displays (DVI-I), an Intel® Core™ Duo processor up to 2.33 GHz, and a wide operating temperature range of -10°C to +50°C. The antivibration design of HDD can resist up to 2Grms.